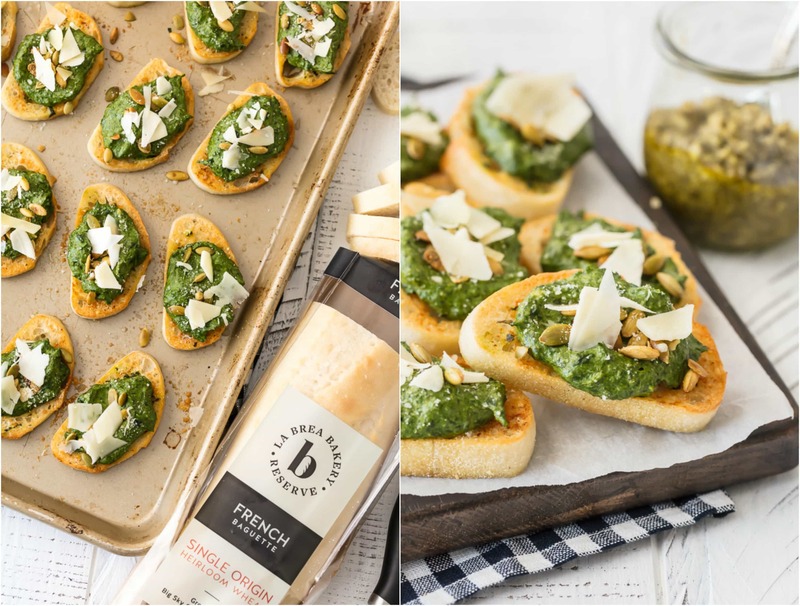 This Parmesan Spinach Dip Crostini Recipe was written in partnership with La Brea Bakery. As always, all opinions are 100% my own. Thanks for supporting the brands that help support The Cookie Rookie! 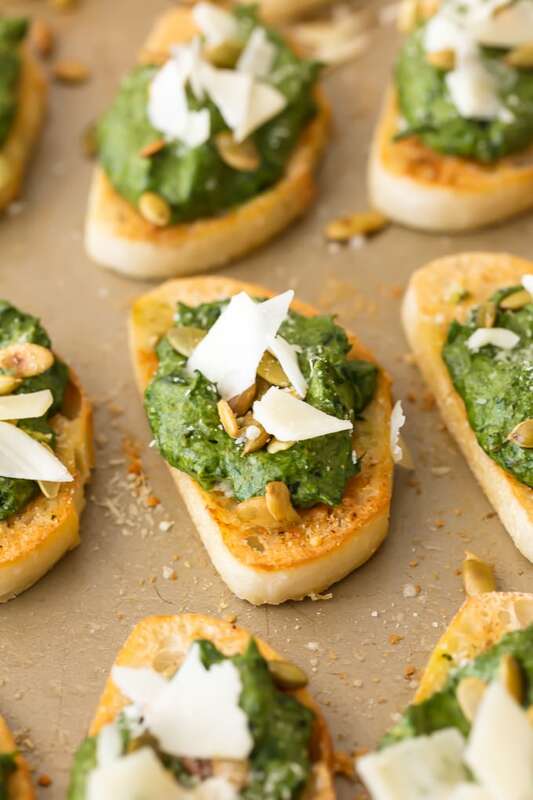 This Parmesan Spinach Dip Crostini is such a classy and unique appetizer to serve at your next party. Spinach Dip is loved by all, and now you don’t need the chips to enjoy! Warm Parmesan Spinach Dip piled onto toasty French Bread is the ultimate in bruschetta recipes. This is one of our favorite game day or holiday recipes to make in a pinch. Spinach Dip is one of my all time favorite appetizers. Why not spread some on some toasty French bread and make the ultimate appetizer? I don’t know why I’ve never though of this before. I love spinach dip and I love crusty French bread…clearly the two seem like a match made in Heaven! A good bruschetta recipe is something everyone should know, because you never know when you might be heading to a potluck, holiday party, or game day celebration. 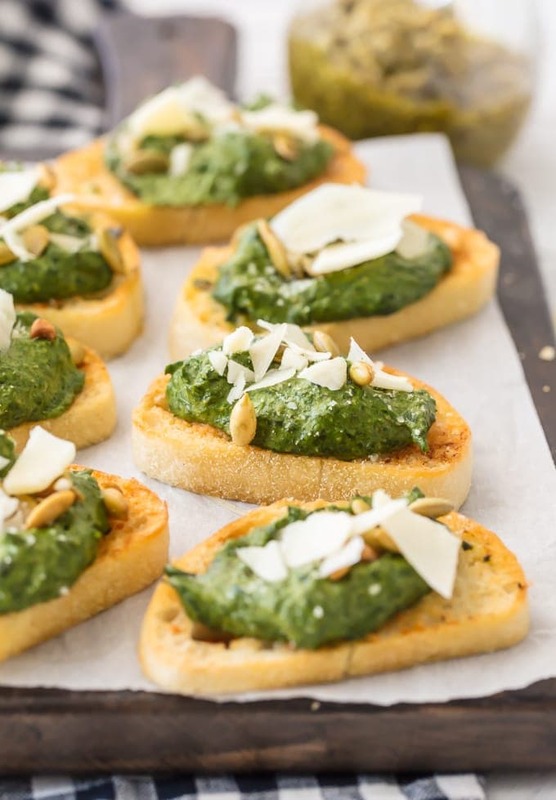 This Parmesan Spinach Dip Crostini is PERFECT for sharing and such a fun and unique recipe everyone will love. 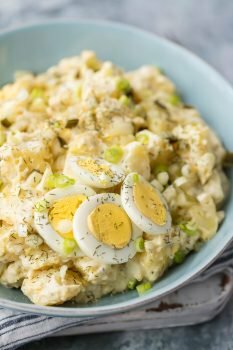 I guarantee that people will be asking for this recipe when you bring a batch to your next soiree. 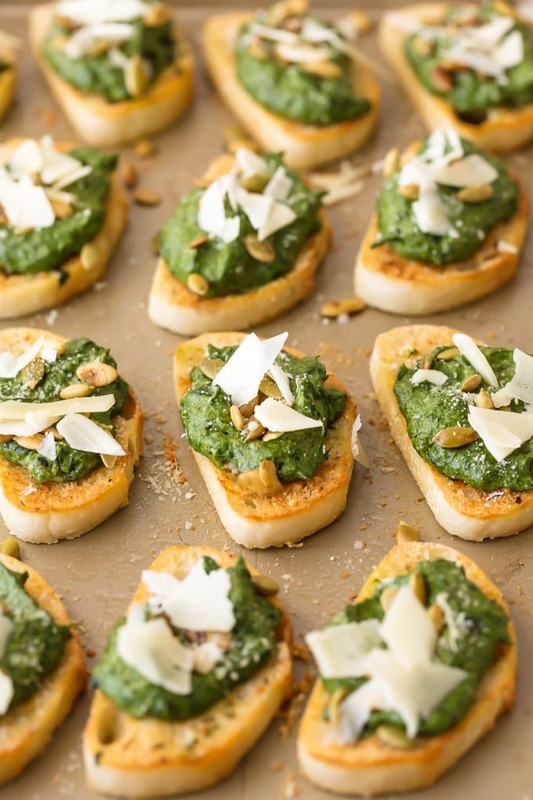 Amazing French Bread is a MUST when making this Spinach Dip Crostini. You guys might remember me working with La Brea Bakery in the past. We have made everything from French Bread Pizza Bites to Individual French Onion Dip Bread Bowls. I say this with all sincerity, their breads are second to none and we are SO lucky to have them at our local grocery stores. La Brea Bakery recently launched their new La Brea Bakery Reserve line of Demi-Baguettes with Kroger and I could not be more excited. This French Baguette…YOU GUYS! La Brea Bakery is proud to share the story of La Brea Bakery Reserve, artisan breads made from single origin heirloom grains. The Fortuna Wheat in these demi-baguettes was grown in the wheat fields of Big Sky Country, Montana, which is a region unlike where other wheat is grown. The result is a crisp crust and creamy crumb from the cracked wheat berries, that embrace the beauty of farming and the true taste of artisan bread. It doesnt taste at all like the other bread at your local store. It tastes like freshly baked bread…and in my case MUCH more delicious than I could ever make myself. I’m so in love. Crispy crunchy outside, and soft delicious inside. I’ve toasted the bread in a mixture of garlic, butter, parmesan and parsley, and then topped it all with the spinach dip made from spinach, parmesan, balsamic vinegar, and cream cheese. It’s such a delicious flavor combination. Everything we love about classic spinach dip but in bruschetta form! Isn’t that fun? 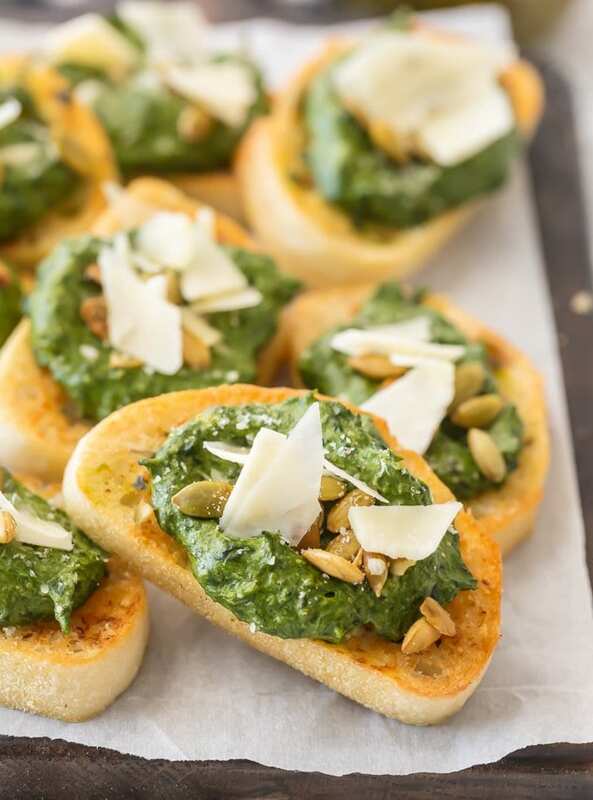 I can’t wait for you to wow the guests at your next party with this Parmesan Spinach Dip Crostini. 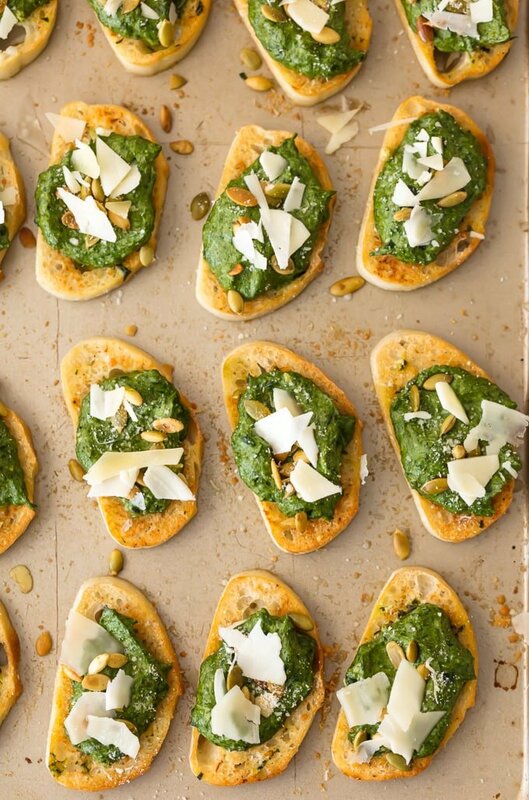 This Spinach Dip Crostini is everything you need for the perfect party. 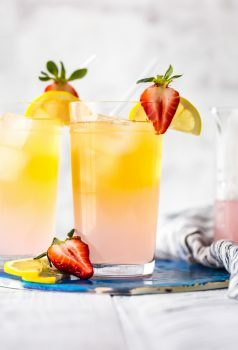 Just mix up some fun cocktails and you’re in business! Be sure to check your local Kroger for La Brea Bakery Reserve Demi-Baguettes. They can be found in the specialty cheese section. You will not regret it! 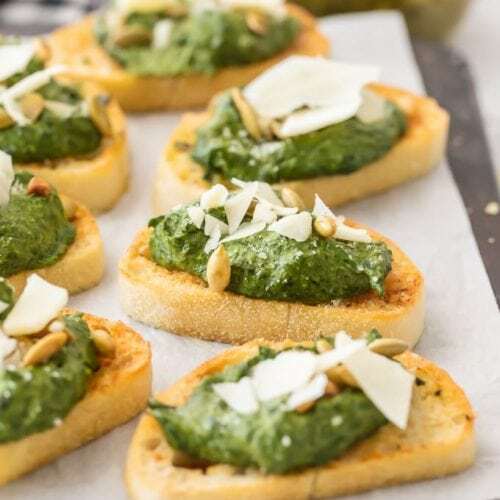 Serve it with your favorite creamy chicken soup, chili recipe, or as the base for this fun Parmesan Spinach Dip Bruschetta. CLICK TO GRAB A COUPON to try it out today! See the recipe card below for details on How to Make Parmesan Spinach Dip Crostini. Enjoy! Spray a large baking sheet with nonstick spray. Lay the bread slices in a single layer on the baking sheet. In a small bowl, mix together the melted butter, garlic, and parsley. Brush each top side of bread liberally with the butter mixture. Take 1/2 cup grated parmesan and sprinkle over the top of each bread slice. Bake in the oven for 5-6 minutes or until toasty and starting to brown on the edges. Remove from the oven and set aside. In a blender or food processor, blend together the spinach, cream cheese, lemon juice, pesto, salt/pepper, vinegar, and remaining 1/2 cup parmesan cheese. Blend until as smooth as you like. Spoon 1 tablespoon of the spinach dip onto each piece of bread and sprinkle with a bit more grated parmesan. If not ready to serve, cover with plastic wrap and keep in fridge up to 6 hours or until ready to serve. When ready to serve, remove from the fridge and place under a broiler for 3-4 minutes or until spinach mixture is hot and bubbly and bread is toasted to your liking. 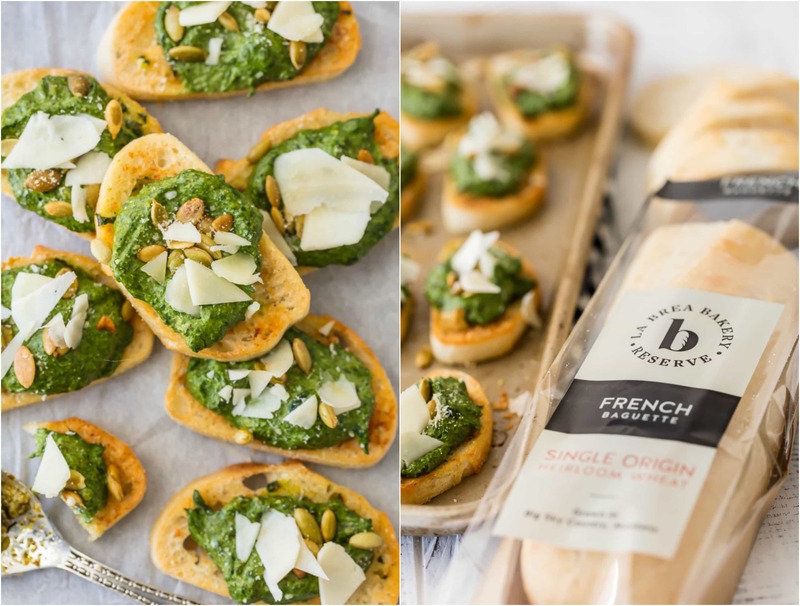 AROUND THE WEB: Love bruschetta? Check out these creative crostini recipe from some of our blogging friends! Pomegranate Goat Cheese Crostini, Sun Dried Tomato Asiago Bruschetta, and Smoked Salmon Crostini.